Sevres biscuit porcelain Sevres bust of J. A. Viala c. 1878. Please refer to our stock # TBD00199 when inquiring. 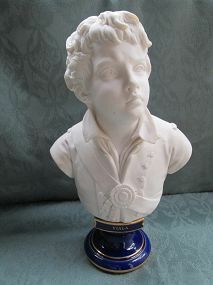 A white nunglazed porcelain bust of a young man on a blue and gilt socle with the name â€œVIALAâ€ in gilt. With the beginning of the third Republic and the end of the possibility of the Monarchy returning, there was a revival of interest in the Revolution. Joseph Agricol Viala was a boy hero of 1793 with his name later inscribed on the Arc de Triomphe. On the back in a rectangle â€œSevresâ€ then â€œER. 87. 1. (LV)â€. Socle with Sevres date in green 85 and Dore mark with 86. 11 Â¾ inches (30 cm) tall. Condition: two small chips to the rosette on his breast and a little roughness on one wing of his collar. Otherwise excellent with bright gilding. It is not surprising that Sevres would revive his image after the last of the monarchies in France.